Rebecca Gates and Philemon Houghton declared their intentions of marriage on Dec 4, 1757 Lancaster, Worcester Co., MA, USA. Rebecca Gates married Philemon Houghton, son of Benjamin Houghton Jr and Ruth Wheelock, in Feb 23, 1758 at Lancaster, Worcester Co., MA, USA. Dinah Osgood and Lemuel Houghton declared their intentions of marriage on Apr 20, 1758 Lancaster, Worcester Co., MA, USA. Dinah Osgood married Lemuel Houghton, son of Benjamin Houghton Jr and Ruth Wheelock, in May 1, 1758 at Lancaster, Worcester Co., MA, USA. Elijah Houghton married Martha Oaks. Priscilla Wilder and Benjamin Houghton 3d declared their intentions of marriage on Jun 12, 1757 Lancaster, Worcester Co., MA, USA; Benjamin, 3d. Priscilla Wilder married Benjamin Houghton 3d, son of Benjamin Houghton Sr and Zeruiah Moore, in Aug 11, 1757 at Lancaster, Worcester Co., MA, USA, Benjamin, 3d, by John Mellen. Priscilla Wilder and Seth Harrington declared their intentions of marriage on Aug 28, 1760 Lancaster, Worcester Co., MA, USA; Widow Priscilla Houghton. Priscilla Wilder married Seth Harrington in Nov 13, 1760 at Lancaster, Worcester Co., MA, USA. Abraham Houghton married Caroline Houghton, daughter of Jonathan Houghton Jr and Mary Houghton, in Nov 21, 1754 at Bolton, Worcester Co., MA, USA, JWH: 11, 21, 1759. Abraham Houghton married Sarah Divol in Oct 8, 1764 at Leominster, Worcester Co., MA, USA, Lancaster VR: Aug 11, 1750, no mp; Houghton: Bolton, 8,11,1750. Capt. Timothy Houghton married Eunice Whitcomb in Jan 13, 1751 JWH: 10 Dec 1738, clearly an error. 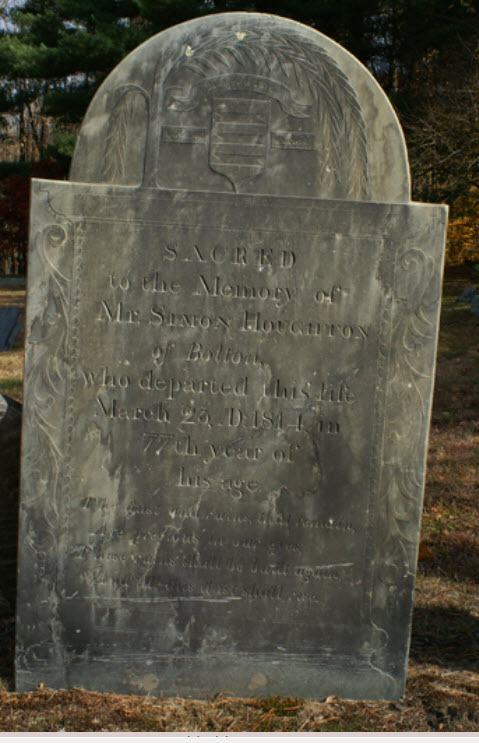 Nourse, Gravestone: "Sacred to the memory of Mr. Simon Houghton of Bolton, who departed this life March 25, A D: 1814, in 77th year of his age. These ruins shall be built again, And all this dust shall rise." Simon Houghton married Martha Stearns in Dec 6, 1770 at Bolton, Worcester Co., MA, USA, VT Gazetteer Index: Martha (Stearns), wife of Simon W. Houghton, v. pt. 2, 67. 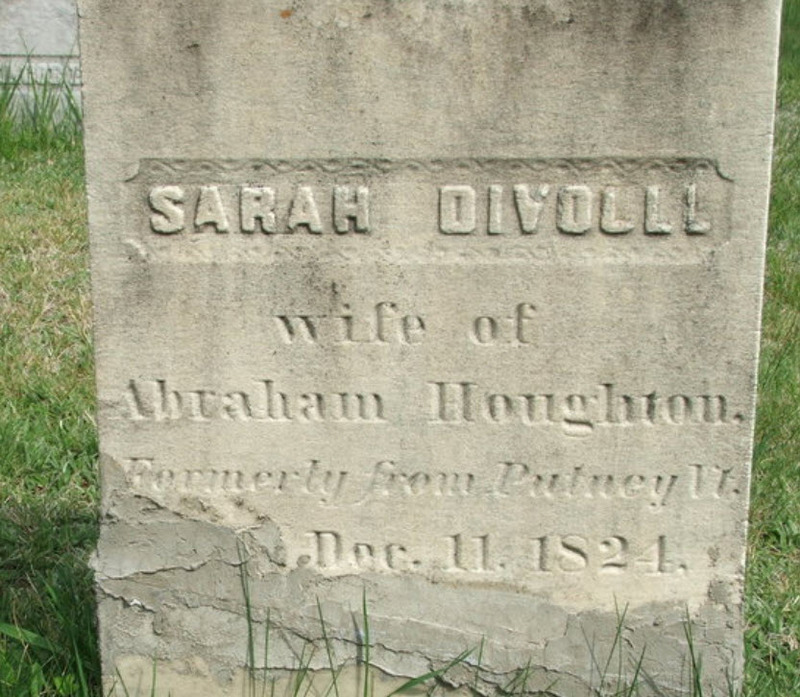 Sarah Divol married Abraham Houghton, son of Ensign Jacob Houghton Jr and Mary Willard, in Oct 8, 1764 at Leominster, Worcester Co., MA, USA, Lancaster VR: Aug 11, 1750, no mp; Houghton: Bolton, 8,11,1750. Caroline Houghton married Abraham Houghton, son of Ensign Jacob Houghton Jr and Mary Willard, in Nov 21, 1754 at Bolton, Worcester Co., MA, USA, JWH: 11, 21, 1759. Eunice Whitcomb married Capt. Timothy Houghton, son of Ensign Jacob Houghton Jr and Mary Willard, in Jan 13, 1751 JWH: 10 Dec 1738, clearly an error. Martha Stearns married Simon Houghton, son of Ensign Jacob Houghton Jr and Mary Willard, in Dec 6, 1770 at Bolton, Worcester Co., MA, USA, VT Gazetteer Index: Martha (Stearns), wife of Simon W. Houghton, v. pt. 2, 67. Birth circa 1715 Lancaster, Worcester Co., MA, USA, dd calc, G.S. Simeon Houghton and Jerusha Taylor declared their intentions of marriage on Feb 4, 1737/38 Lancaster, Worcester Co., MA, USA. Jotham Houghton and Esther Taylor declared their intentions of marriage on Nov 12, 1759 Petersham, Worcester Co., MA, USA; DAR correction: 1.12.1750. Jotham Houghton married Esther Taylor in Dec 19, 1759 at Harvard, Worcester Co., MA, USA, MLM: Dec. 17. Jotham Houghton married Eunice Wilder in Oct 6, 1762 at Petersham, Worcester Co., MA, USA. Thaddeus Houghton married Prudence Wilder in May, 1765 at Petersham, Worcester Co., MA, USA. Death CJV: prob. died young, given brother of same name born in 1741; Weis: d.y. Phinehas Houghton married Ruth Osgood in Jun 6, 1753 at Lancaster, Worcester Co., MA, USA. Lois Houghton and Paul Sawyer declared their intentions of marriage on Dec 16, 1757 Lancaster, Worcester Co., MA, USA. Lois Houghton married Paul Sawyer in Mar 7, 1758 at Lancaster, Worcester Co., MA, USA, MLM: Mar. 17. Joseph Houghton married Mary Wilson in Jan 31, 1758 at Lunenburg, Worcester Co., MA, USA, by Edward Hartwell; Leominster VR: Marcy, p. 76, no md; p. 217, md, gives Lunenburg as mp. Eunice Houghton and Aquilla Jewett declared their intentions of marriage on Feb 19, 1764 Littleton, Middlesex Co., MA, USA. Eunice Houghton married Aquilla Jewett in Mar 22, 1764 at Littleton, Middlesex Co., MA, USA. Capt. Benjamin Houghton Tert. and Achsah Whitcomb declared their intentions of marriage on Sep 21, 1763 Lancaster, Worcester Co., MA, USA; Benjamin, Tert. and Axey Whetcomb. Capt. Benjamin Houghton Tert. married Achsah Whitcomb, daughter of Simon Whitcomb and Thankful Houghton, in Oct 14, 1763 at Lancaster, Worcester Co., MA, USA, DAR Patriot Index, p.345: Benjamin: b 9-5-1739 d 7-31-1802 m Zervia Moore Capt MA; DAR Patriot Index, Cent. pt 2, p. 1494 corrects: m Achsah Whitcomb and MA for bd and dd; Princeton Hx: for diff. Benjamin, in Princeton, Oct. 14 in Princeton. Israel Houghton and Alice Campbell declared their intentions of marriage on Apr 8, 1769 Lancaster, Worcester Co., MA, USA; Keene VT VR: Israel and Alice Houghton; MLM, Weis: md April 10, 1769. Capt. John Houghton married Mary Allen. Birth Oct 4, 1714 Stow, Middlesex Co., MA, USA, BT: The Stow records show that Jerusha, dau. of John and Esther Taylor, was born Oct. 4, 1714. Jerusha Taylor and Simeon Houghton declared their intentions of marriage on Feb 4, 1737/38 Lancaster, Worcester Co., MA, USA.